A bluebird day at Little Lyford after the big snowfall on Saturday. 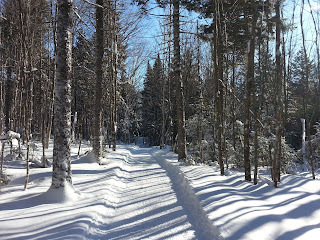 It was a great weekend in the Maine Woods with more snow than expected from Winter Storm Nemo! Gorman Chairback Lodge & Cabins received about 12" of fluffy powder, while areas near Little Lyford Lodge & Cabins ended up in a bigger snow belt with approx. 18-20"! 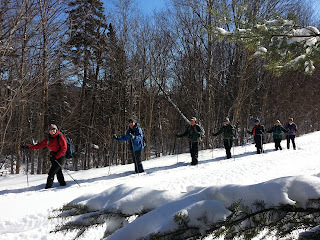 Excellent skiing on the Lodge to Lodge Trail! All 97km of trails are now open and groomed after our big snowfall this weekend. Ski conditions are excellent and with more snow on the way today, they'll only improve! There are plenty of backcountry trails broken and yet to be broken out for your off the beaten path adventures. Check out our winter trail maps here! It's a fabulous winter here in the Maine Woods. Come play in our winter wonderland - we've got endless miles of both groomed and backcountry trails and enough snow for everyone!